Ingredients: Phosphoric acid anhydride and potassium hydroxide. 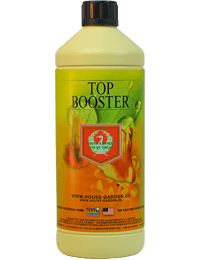 Mix 15 ml Top Booster to 10 liters of nutrient solution for 3 to 4 days, 3 weeks before harvest. Note: Exact week of application will vary depending on the flowering cycle of your specific plant.